Anyone can write a book. Put a pen to paper or get those fingers moving on your computer’s keyboard. Type or print or write a word. Then another. Now a sentence, then a paragraph, put together a chapter and repeat. Do this over and over again. At the end of it you will have a book. See? All it takes is time. The hard part is writing a book people want to read. 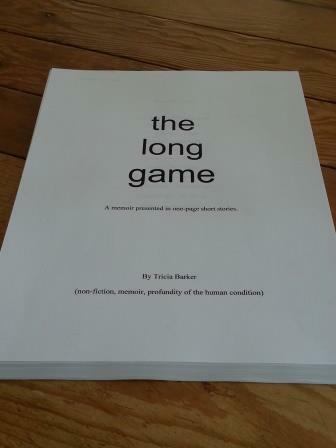 I finished what I hope is the final edit on my book yesterday. And I’ll be honest with you, the process was not easy. At some point you decide you want the story to be well told. And that meant I had to throw out most of what I had written and start again. The first version was a mere shadow of this final draft. Thank goodness. And thank goodness I’ve had the help of so many people over the last year with the process. When the time comes I will spend hours writing the acknowledgment section of my book to make sure I include all those precious names. My heart has not forgotten one of you. I have done what anyone could do. I wrote a book. No big deal. Anyone can do it. That is the crazy making part. Actually, I have to say that writing a book is hard work too – you should give yourself a lot of credit for finishing. But keep going – agent, publisher to my book shelf – I can’t wait to read it! Congrats on reaching this milestone, Tricia! Keep us updated on your progress. I know I would love to read your book! I will be more than happy to read it. Now that you’ve birthed your “baby”, I wonder what your next project will be?? I’m going to start going into bookstores and asking if they have your book ….get their buyers looking for YOU!